Website for the Blender development fund. 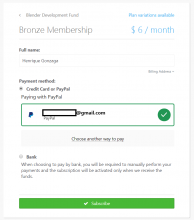 Dang Duong (khanhduong95) added a comment to T59071: payment issues on fund.blender.org. Is the payment system working? I am going to pay for the Gold membership but the system always takes me back to the "choose payment method" page along with the error message "Transaction Not Allowed". The same thing happens if I choose PayPal as the payment method (using the same credit card). I am sure there is nothing wrong with my card as I can donate to other free software projects normally. Sybren A. Stüvel (sybren) added a comment to T59071: payment issues on fund.blender.org. Sybren A. Stüvel (sybren) closed T58458: TCP/IP sockets instead of UNIX sockets as Resolved. Sybren A. Stüvel (sybren) lowered the priority of T57960: Record transaction ID on Braintree failure from Confirmed, High to Normal. Pablo Vazquez (pablovazquez) closed T59085: Overlapping label in thermometer as Resolved by committing rBDF9efd19bad3e0: UI: Flip overlapping thermometer label..
Francesco Siddi (fsiddi) updated the task description for T59085: Overlapping label in thermometer. Francesco Siddi (fsiddi) triaged T59085: Overlapping label in thermometer as Confirmed, Medium priority. Bastien Montagne (mont29) renamed T59071: payment issues on fund.blender.org from Site error to payment issues on fund.blender.org. Sybren A. Stüvel (sybren) triaged T58458: TCP/IP sockets instead of UNIX sockets as Confirmed, High priority. Sybren A. Stüvel (sybren) closed T57748: Bank payments as Resolved. Sybren A. Stüvel (sybren) closed T58082: Choosing bank payment returns 405 error as Resolved. Francesco Siddi (fsiddi) triaged T58082: Choosing bank payment returns 405 error as Confirmed, High priority. Sybren A. Stüvel (sybren) triaged T58015: Add slug to membership levels as Normal priority. Sybren A. Stüvel (sybren) triaged T57970: Go back to user page in admin after 'log in as user' as Confirmed, Low priority. Sybren A. Stüvel (sybren) triaged T57960: Record transaction ID on Braintree failure as Confirmed, High priority. Sybren A. Stüvel (sybren) triaged T57959: Install Sentry on Sintel as Normal priority. Sybren A. Stüvel (sybren) closed T57751: Streamline login flow as Resolved. Ton Roosendaal (ton) added a comment to T57751: Streamline login flow. Sybren A. Stüvel (sybren) moved T57117: Financial reporting in Open Data from Backlog to Low prio on the Blender Development Fund board. Sybren A. Stüvel (sybren) lowered the priority of T57117: Financial reporting in Open Data from Normal to Confirmed, Low. Sybren A. Stüvel (sybren) moved T57248: Prevent paying already-paid orders from Backlog to Low prio on the Blender Development Fund board. Sybren A. Stüvel (sybren) lowered the priority of T57248: Prevent paying already-paid orders from Normal to Confirmed, Low. Sybren A. Stüvel (sybren) moved T57674: Allow upgrade/downgrade of membership level from Low prio to Nice to have on the Blender Development Fund board. Sybren A. Stüvel (sybren) lowered the priority of T57674: Allow upgrade/downgrade of membership level from Normal to Confirmed, Low. Sybren A. Stüvel (sybren) moved T57674: Allow upgrade/downgrade of membership level from Backlog to Low prio on the Blender Development Fund board. Sybren A. Stüvel (sybren) updated the task description for T57675: Separate next payment date and deactivation date. Sybren A. Stüvel (sybren) updated the task description for T57355: Flexible Payments. Sybren A. Stüvel (sybren) closed T57355: Flexible Payments as Resolved. Shifting next_payment date by pay-whatever-you-want is implemented in 72843f3. Note that this does not allow manual payments. Sybren A. Stüvel (sybren) assigned T57748: Bank payments to Pablo Vazquez (pablovazquez). Implemented in f889797, now in Pablo's hands for polishing the UI. Francesco Siddi (fsiddi) raised the priority of T57751: Streamline login flow from Normal to Confirmed, High. Francesco Siddi (fsiddi) triaged T57751: Streamline login flow as Normal priority. Sybren A. Stüvel (sybren) triaged T57748: Bank payments as Confirmed, High priority. Sybren A. Stüvel (sybren) closed T57671: Easy adding of Managed Memberships as Resolved. Sybren A. Stüvel (sybren) triaged T57675: Separate next payment date and deactivation date as Confirmed, Low priority. Sybren A. Stüvel (sybren) triaged T57674: Allow upgrade/downgrade of membership level as Normal priority. Sybren A. Stüvel (sybren) triaged T57671: Easy adding of Managed Memberships as Normal priority. Sybren A. Stüvel (sybren) closed T57356: Reminder for managed memberships as Resolved. Sybren A. Stüvel (sybren) assigned T57451: AMEX payment with USD not supported to Francesco Siddi (fsiddi). Assigning to @Francesco Siddi (fsiddi) because he's doing the paperwork to get AMEX USD support. Sybren A. Stüvel (sybren) closed T57301: Adding payment methods is not possible as Resolved. Sybren A. Stüvel (sybren) lowered the priority of T57451: AMEX payment with USD not supported from Confirmed, High to Normal. Sybren A. Stüvel (sybren) added a comment to T57301: Adding payment methods is not possible. 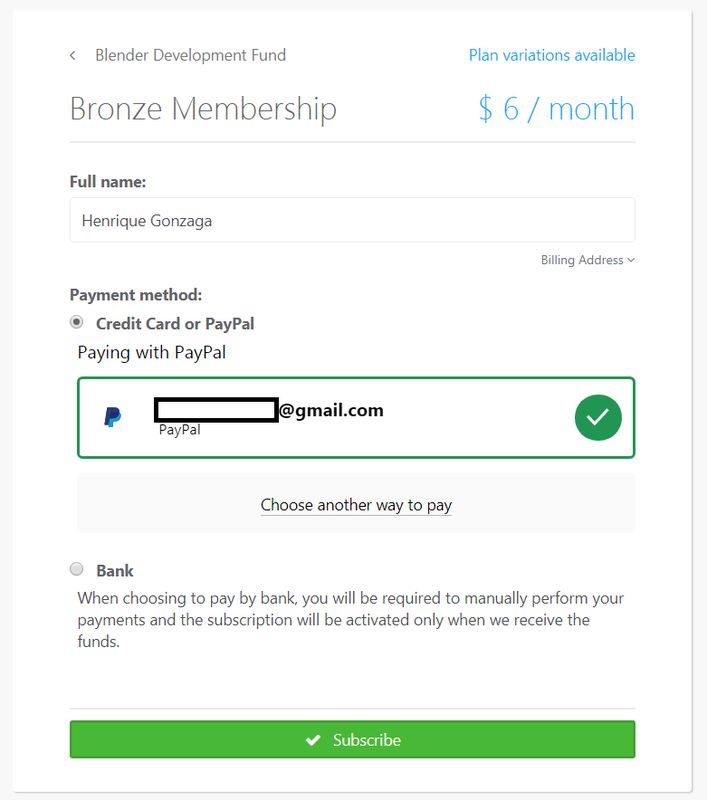 This will be reworked so that adding a payment method is done for changing the PM attached to a running subscription. Partially fixed in 0a6e0fa7536a4475c70ea72b8450e0bba1758033. At least now it's no longer possible to select payment methods that are only supported for a single currency. Sybren A. Stüvel (sybren) removed a project from T57451: AMEX payment with USD not supported: Infrastructure: Blender.Org. Sybren A. Stüvel (sybren) renamed T57135: Only create membership for specific Looper product from Only create membership for specific Looper produc to Only create membership for specific Looper product. Sybren A. Stüvel (sybren) closed T57101: create AmountField as Resolved. Sybren A. Stüvel (sybren) updated the task description for T57146: Add link to membership details on landing page.